Not enough is said about smaller businesses; they need differentiation to thrive but must also succeed at customer service. Matouk, a family-owned American luxury bed linen manufacturer decided to invest in a cloud based ERP solution with the right technology partners and the net result was the agility to compete on both price and service while growing customer relationships – and they did it better than many of their web-based competitors. In a little over six months, Matouk received a 223% ROI. Founded in 1929, Matouk persevered through nearly a century of challenges because of its customer-centric focus. In 2014, Matouk recognized the need for the kind of data connectivity only a powerful technology platform could provide – one that would improve and connect all its operations from the customer, to inventory, to manufacturing. Matouk has a more manageable shop floor with only one factory and about 100 employees. While that sounds simple, every enterprise requires smart IT systems that can connect the financials, orders and inventory, and shipping to management and manufacturing. Matouk had relied too long on legacy systems which, because they were all separately built, make integration difficult and limited in scope. In addition, there was no platform for feedback with Matouk’s shop floor, and no CRM, giving a limited view of the customer. 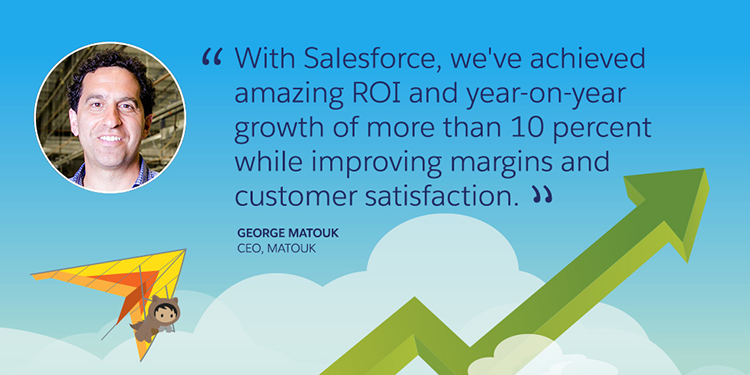 Matouk took the leap to streamline and connect their business processes, by choosing the Salesforce CRM platform and Rootstock, an AppExchange partner and Salesforce-native ERP solution, to digitalize its management and manufacturing business.